If you missed Christmas in July on Saturday, not to worry. 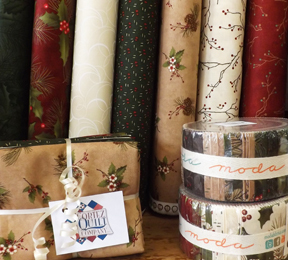 We still have plenty of beautiful holiday fabric ready for you to take home and get an early start on your projects. Shown here is this year's Advent Calendar, matching soft book for the little ones, and a table runner made from one of the new collections. 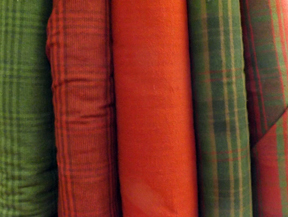 Here's a close up of the collection used in the table runner. We have jelly rolls and charm packs to go with the yardage. Don't forget to enter the Chickadee Challenge! 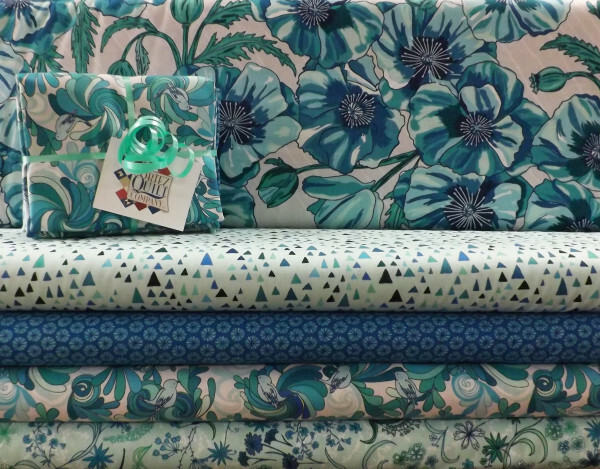 Buy the panel and use some of this beautiful coordinating fabric to create a masterpiece. Get the details at the shop about your chance to win a $50 gift certificate. This luscious Christmas flannel will make beautiful sofa throws to display and use during the holiday season. The image here reads sort of orangey but it's actually a deep, true red. We have raggy shaggy kits ready to go. 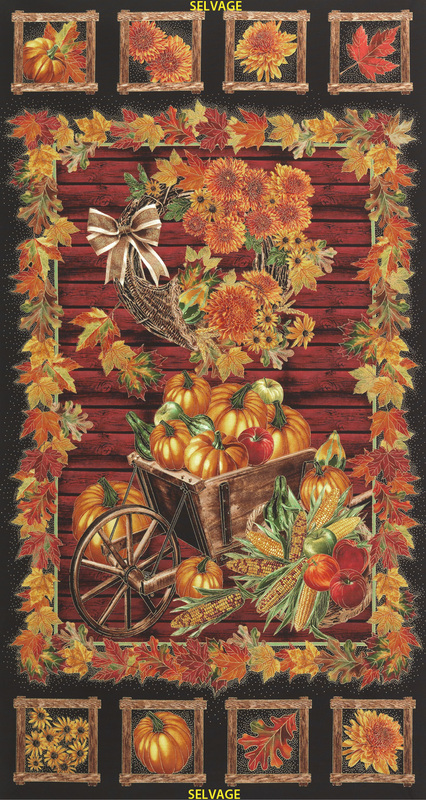 And if you're not quite in the mood for Christmas and winter yet, how about a quilt made from our new cheery summer collection? This pretty black/red/gray/white collection arrived this morning. Then we were all wowed by a fall collection that arrived this afternoon. 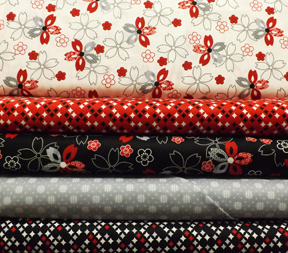 This panel is available with six gorgeous coordinating fabrics. This group has just the right amount of "bling." In this afternoon class you’ll make any one of these cute zippered pouches and maybe even more than one. 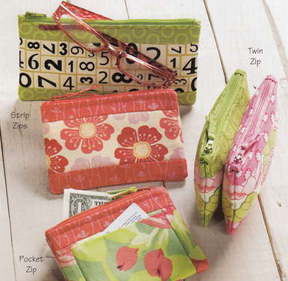 Quick to make, the “Cash and Carry” collection holds your change, bills, credit cards, sunglasses, and more. Aimee King will teach this class. No homework. 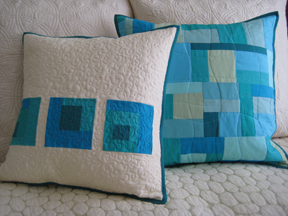 Mix modern and traditional piecing to create unique quilted pillows. 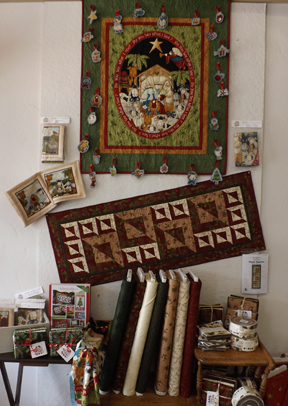 Techniques include uneven log cabin piecing, strata piecing, free motion quilting, faux free motion quilting, and making binding for pillows. We will watch a video presentation from 5:15 until 6:00. If you’d like to stay and make a pillow bring your machine. Please call 970-565-7541 or e-mail Cindy no later than Monday, July 27 at noon to reserve your space. You do NOT need to own a BERNINA to attend. Wow! The last time we did an online survey we received 31 responses. As of 1:00 p.m. today we'd received 189 responses to the survey that was sent out last week. Thanks to everyone who responded. Special appreciation to the 130 people who took the time to write a comment at the end of the survey about how we're doing in general. I'm pleased to report that out of 130 comments there were only two negative comments. One was about an issue that we'd already been discussing here (related to classes) and you'll read more about the solution to that in an upcoming newsletter. All of the other comments were overwhelmingly positive with a few great suggestions sprinkled in. Believe me when I say that we take every single comment and suggestion very seriously. We asked about staying open later. It was interesting that several of you commented that what you'd really like is for Cortez Quilt Company to open a bit earlier. So, we're doing both. Effective Monday, July 27 our new hours will be Monday through Saturday from 9 a.m. until 6 p.m.
Beginning in September we will offer one evening class each month. If the classes are well-attended we will expand to offer additional evening classes. We'll also offer occasional Sunday afternoon classes. Yes you can! 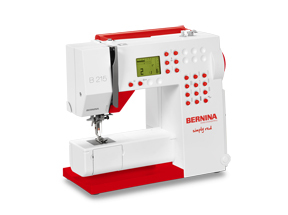 In an effort to ensure that anyone who truly wants to sew on a BERNINA can do so, we've reduced our everyday price on the 215 to only $799. With eleven practical stitches the 215 meets all your basic requirements. The powerful motor boasts high needle penetration power, so you can also sew thick and multi-layered fabrics. At 900 stitches per minute you'll have your projects done in no time. Don't wait to own a BERNINA. If you sew, you deserve a great machine! We've decided not to routinely stock sergers and the three we have on the shelves now are priced to move. If you need a serger now is a great time to get one at a fabulous price. Here's what we have . 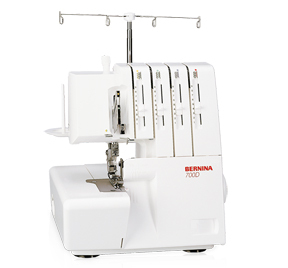 . .
BERNINA 700D (two in stock): MSRP is $1,099. Clearance price is $699. BERNINA 1300MDC (one in stock): MSRP is $2,299. Clearance price is $1,599. We will continue to order sergers for our customers who need them. BlocLoc rulers are finally here (they were on back-order). 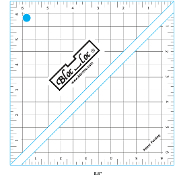 If you make half square triangles check out these rulers. We have them in 4", 6", and a set of three (2", 4", 6"). Watch this six-minute video where Ricky Tims teaches Alex Alexander how to make flying geese units with only one seam. Karen quickly tested the technique and then played around with stitching down the little pockets that are created when sewing the unit. 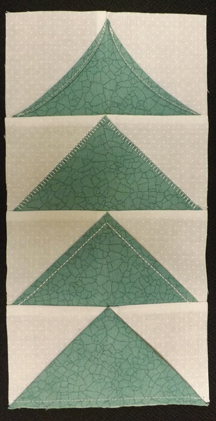 The top one was done with a straight stitch and the curve method from the Southwind Designs patterns (Mexican Stars, Victorian Table Runner). The second one was stitched down with a blanket stitch and the third with a triple straight stitch. The last unit was left alone with the pockets open.